Take in a day of exciting adventure activities when you enjoy swimming with the dolphins and riding the fastest roller coaster in Latin America at Six Flags Mexico. You can spend the day enjoying the scenery of this amazing park and learn about the environment of marine mammals like dolphins. 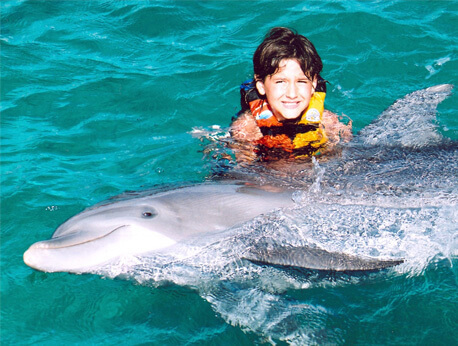 Experience an amazing day of adventure and fun when you combine swimming with the dolphins along with the activities and thrilling rides of Six Flags Mexico. You will have the chance to learn about the habitat of marine mammals, enjoy the thrill of carnival rides, and savor your new family memories. Your day will be filled with adventure activities that will keep you busy from beginning to end. Your day begins with a quick orientation on what to expect while you enjoy swimming with the dolphins. The program has been designed to help kids learn more about the natural environment of the dolphin world. You will get to shake hands and kiss with the dolphins at Dolphin Discovery Park. You can even take pictures with you and the dolphins while swimming beside them. Once you have finished your dolphin adventure, you will spend the day enjoying activities and attractions in Six Flags Mexico. The park includes exciting roller coasters with names like the Boomerang and Batman the Ride where you will experience being inverted while soaring along the tracks. The park also includes Superman, the last escape. This roller coaster is known for being the fastest as well as the highest coaster in Latin America. Six Flags Mexico also includes extreme carnival rides like the Wild River rafting ride, the SkyScreamer, Hollywood Speedway GoCarts, X-Flight Sky Coaster and the Bugs Bunny Circus. Six Flags Mexico also includes plenty of special events and shows that can keep you entertained. When visiting Six Flags Mexico, it is recommended that you bring plenty of money for food and beverages as well as transportation. You should also bring a towel and sunscreen to protect yourself from the sun during your swim with the dolphins. Six Flags Mexico is located on the southern edge of Mexico City, Mexico and is next to the Tlalpan Forest. The Amusement Park includes 110 acres of fun and exciting rides and attractions for you to enjoy throughout the day.